Susan Wechsler makes dress-form substrates specifically for mosaics and has turned her intimate knowledge of costume design into a mosaic specialty. Now, you too can indulge a love of all-things-fashion in the mosaic medium JUly 1-3 at the Institute of Mosaic Art. We’re just back from the whirlwind experience known as the SAMA Summit, which took place this year in San Diego, and we thought we’d share some photos and highlights with those in our community who weren’t able to make it. “Because the Craftsman style in architecture is so closely identified with Berkeley, I thought that making mosaic numbers and letters in a Craftsman font would be a good idea for a class. Signs and house numbers would be simple projects, even for beginning students,” Debbie Block says. 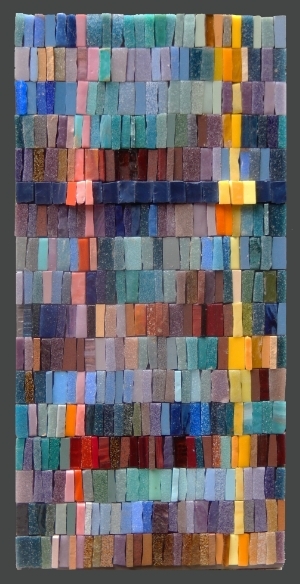 "I am fascinated by the things that others discard," says mosaic artist Luci Lytle, whose materials are 95% recycled.